Visit Jasper National Park in March for fantastic skiing, quiet trails, great wildlife viewing, and affordable accommodation. The sun is setting and painting the mountains brilliant shades of pink as we drive into the town of Jasper. Elk lazily cross the street without a sideways glance. They're headed for their favorite spot, the front lawn of the Visitor Centre, in the heart of town. We decide to follow suit, ditch the car, and explore on foot. 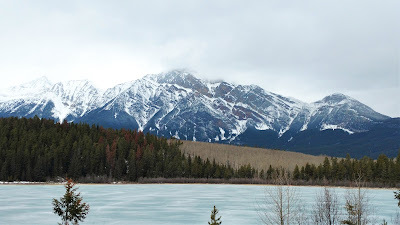 It's late March (Spring Break), and the weather is mild compared to Lake Louise, where we began our journey. Jasper's lower elevation (1060 m vs 1600 m for Lake Louise) means spring comes sooner here. While cross country ski season is over and many winter roads remain closed, alpine skiing is still going strong at Marmot Basin, and wildlife viewing is better than ever. Streets that were packed in the summer are now half empty. A few blocks down the road, we score a table at Evil Dave's Grill - one of the best restaurants in town - without a reservation. 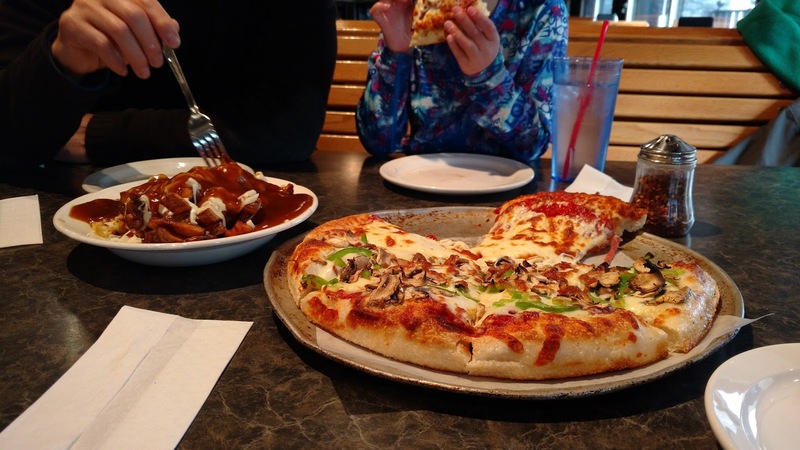 Over "sinful starters" - Holy Cow is my favorite - and delectable Karma Curry, we ask the kids what their favorite stop was along the Icefields Parkway. Unanimously, they say, "bum sliding" on The Toe of the Glacier Trail. 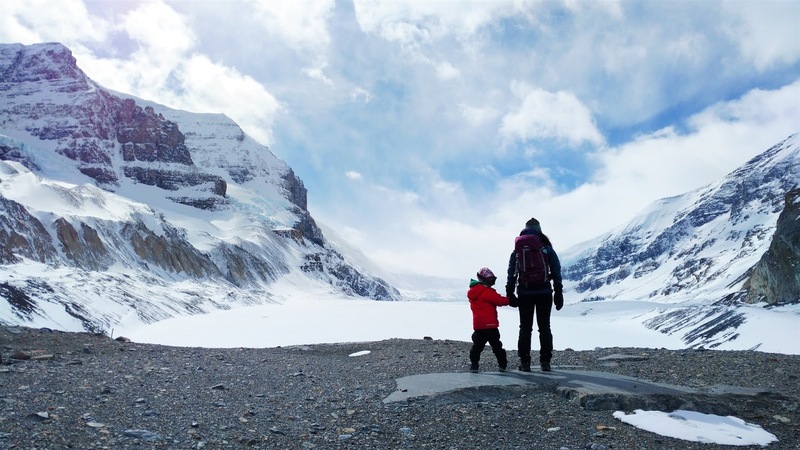 Never mind that the Columbia Icefield is the largest ice field in North America's Rocky Mountains; to the kids it's just another fun place to play in the snow! Check out more great stops on the Icefields Parkway in: Touring the Icefields Parkway with Kids. 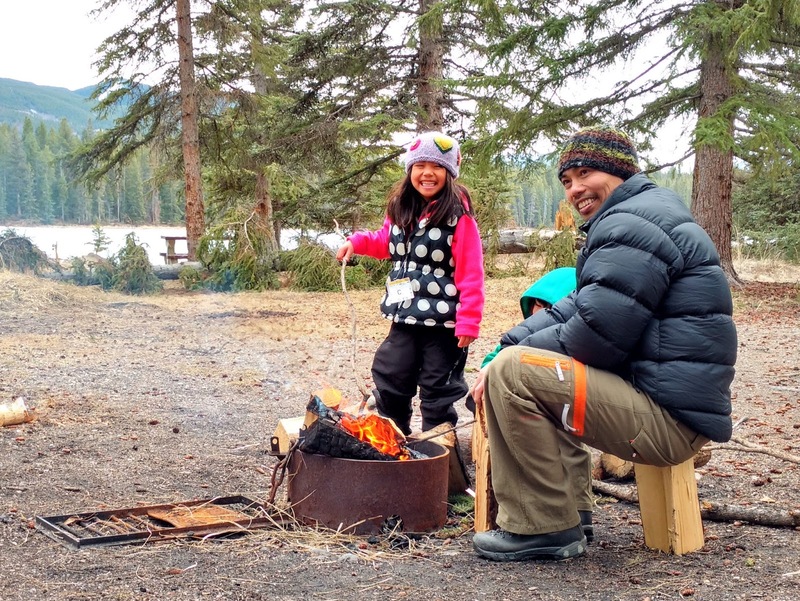 Where we walk on a frozen riverbed to dazzling ice falls, have a bonfire, and hike some more. 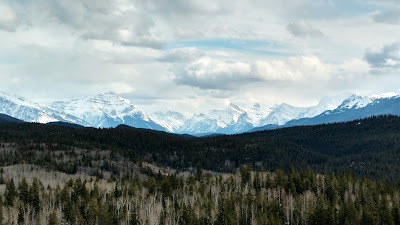 After scones and coffee at Bear's Paw Bakery, we drive past herds of bighorn sheep and elk to Maligne Canyon. We peer into the depths of the canyon - over 50 metres (160 feet) deep near the second bridge - at natural ice sculptures. At the winter Canyon Access Point, we descend onto the frozen riverbed and gain an entirely different perspective. The falls look bigger from below and change color depending on how the light hits them. We've arrived before the tour groups and have the canyon to ourselves, so we linger and enjoy the solitude. 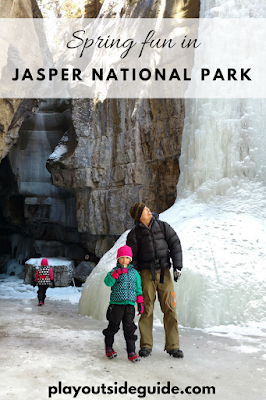 Read about our experience here: Magical Maligne Canyon Ice Walk. Lunchtime finds us at Lake Annette for a picnic and bonfire. It's quiet, save for a few cheeky whiskeyjacks who have come see what's on the menu. They flit from tree to tree, closer and closer, until they realize we don't have any handouts for them. Next stop is Old Fort Point Loop Trail (3.4 km) near the Athabasca River. It's a short, steep climb to the lookout where locals tell us they just saw a grizzly in the woods! Not wanting to bother a hungry bear recently out of hibernation, we return the way we came. At least we got to enjoy the view from the top! Feeling peckish ourselves, we return to town for extra cheesy pepperoni pizza at Lou Lou's, and a swim at our hotel. It's been an active, fun filled weekend minus crowds... unless you count all the animals. Note: Snow sports are weather dependent. Check the Jasper Trails Reports for current information before you go. Alpine Skiing: Marmot Basis Resort is open from early November to early May. They've just opened a new expert area, Tres Hombres, with "complex, steep fall line riding." Cross Country Skiing in Jasper usually winds down in mid to late March. Check the Jasper Trails Reports for current information. Dogsledding tours are available from several companies in Jasper. See Jasper Travel for more information. Conditions are variable in early spring. Pack microspikes/ice cleats just in case! Maligne Canyon is the premiere accessible early spring hike. For your safety, Parks Canada recommends going with a guide. Maligne Adventures offers tours from mid December to late March, weather and conditions permitting. 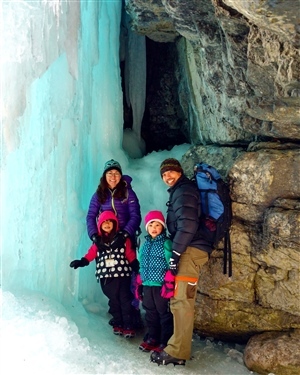 Read our trip report here: Magical Maligne Canyon Ice Walk. Visit Athabasca Falls then drive a little further south to hike Valley of the Five Lakes (4.5 km loop) and get a photo at the red chairs! Hike Lac Beauvert Loop (3.4 km) from iconic Jasper Park Lodge. Walk to Pyramid Island (200 metres) for beautiful views of Pyramid Mountain. This is also a great star gazing spot! Snowshoe Medicine Lake's shoreline (3 km from northern viewpoint) for stunning views of the Endless Chain Ridge. Mary Schaffer Loop (3.2 km) at Maligne Lake is a scenic trail that starts near the boathouse. Stargazing: Jasper National Park is the world's largest accessible Dark Sky Preserve. Great star gazing locations near town include Pyramid Lake Island, Lake Annette, and Lac Beauvert. 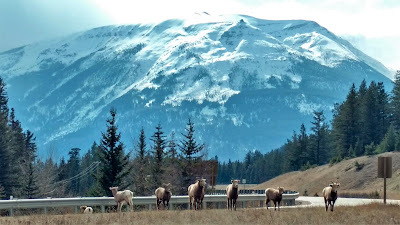 Wildlife Viewing is excellent in Jasper National Park. 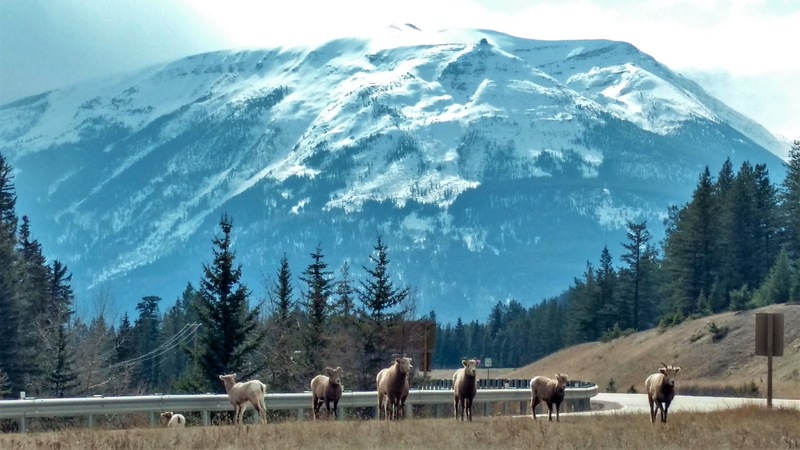 Elk are often seen in the townsite, but another great spot to see bighorn sheep and elk is near the junction of the Yellowhead Highway and Maligne Lake Road. Stay in your vehicle and never feed wildlife (you could be fined up to $25,000). Jasper Skytram takes you up Whistler's Mountain for panoramic views of Jasper National Park and beyond. Open March 22-October 27, 2019. Jasper Planetarium offers planetarium shows and telescope programs with the largest telescopes in the Rockies. Check hours here. Glacier Adventure and Skywalk at Columbia Icefield is open April 19 - October 21, 2019. Reservations recommended. Note that Miette Hot Springs is closed from early October until early May each year. 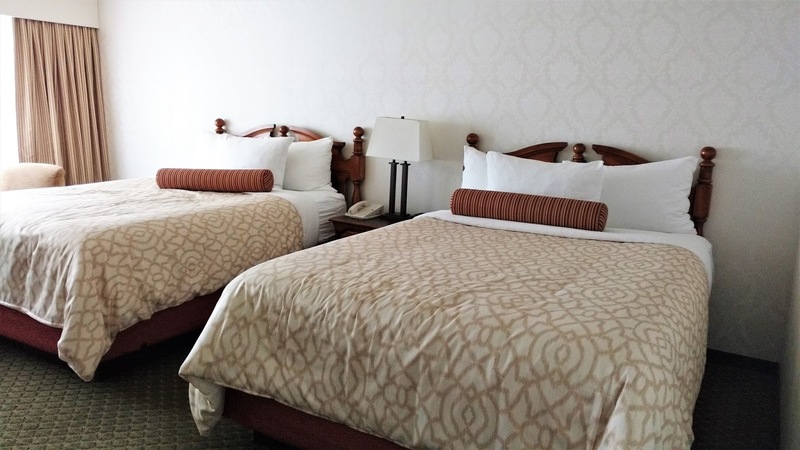 Jasper has a good selection of hotels and cabins open year round. 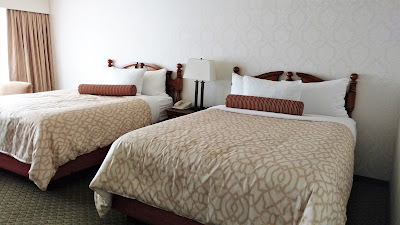 We stayed at newly renovated Chateau Jasper and really enjoyed it; especially the pool and hot tub! The hotel is far enough from the train that we all slept well. The town of Jasper is located at the north end of the Icefields Parkway (Highway 93 N); 413 km from Calgary and 365 km from Edmonton. Big Agnes Ice House Hoodie Review: Big on Warmth!